The AFOQT Instrument Comprehension Subtest is 20 questions long but only allows for completion in 6 minutes. Questions are focused on your ability to do assessments and determine an aircraft’s position in flight. Candidates must be able to assess instruments and their readings, including compass heading, climb or drive and degree of banking to the right or the left. This part of the test measures your ability to determine the position of an airplane in flight from reading instruments showing its compass direction heading, amount of climb or dive, and degree of bank to right or left. Each problem consists of two dials and four answer options. In each problem, the dial on the left is the Artificial Horizon. 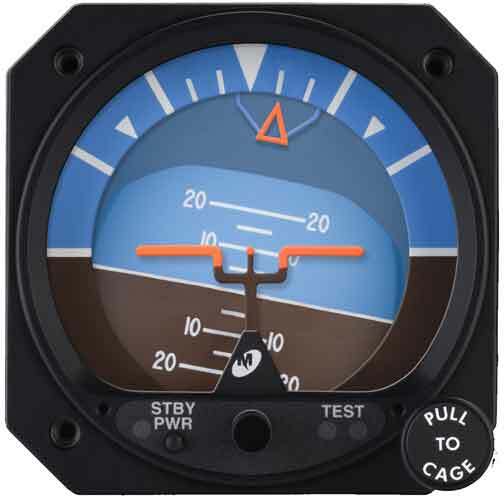 On the face of the dial an orange colored stationary indicator in the center represents the airplane, while the positions of the thin white line, orange triangle pointer, and markings along the outer edge vary with changes in the position of the airplane in which the instrument is located. On the Horizon Indicator to the left, the aircraft is ascending slightly and banking slightly to port. NOTE: The Artificial Horizon used in this exercise displays a maximum ascent angle or descent angle of only 20-degrees. The aircraft have a performance envelope that far exceeds the limitations of the indicator. In cases where the aircraft is ascending or descending at an angle greater than +/- 20-degrees, the Artificial Horizon will be “pegged” at either the top or the bottom of its range of travel. In each problem the right-hand dial is the Compass. On this dial, the nose of the aircraft indicates the compass direction in which the airplane is headed. 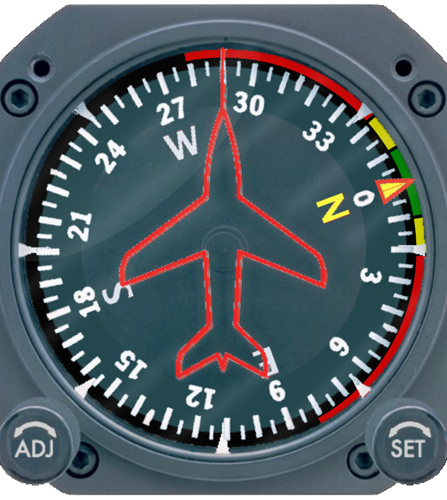 On the Compass indicator, the red aircraft outline is stationary and the Compass numbers rotate around the outside of the dial to indicate heading. On the compass to the right, the aircraft is heading 290, or approximately West-North-West. Each problem consists of two dials and four airplanes in flight. 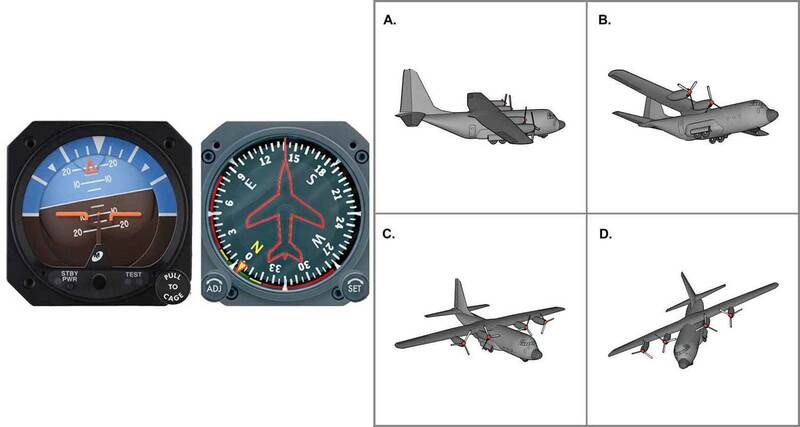 Your task is to determine which one of the four airplanes is MOST NEARLY in the position indicated by the two dials. You are always looking north at the same altitude as the four airplanes. East is always to your right as you look at the page. In sample question below, the Artificial Horizon shows that the airplane is banked slightly to starboard with a 10-degree rate of decent. The Compass shows that it is headed 140 which is roughly southeast. The only one of the four airplanes that meets these specifications is in the box lettered C; so, the answer to the sample question is C.
Click the “Start Quiz” button below when you are ready to begin!